Happy Thursday amazing Friends, and welcome to Furniture Fixer Upper Day! 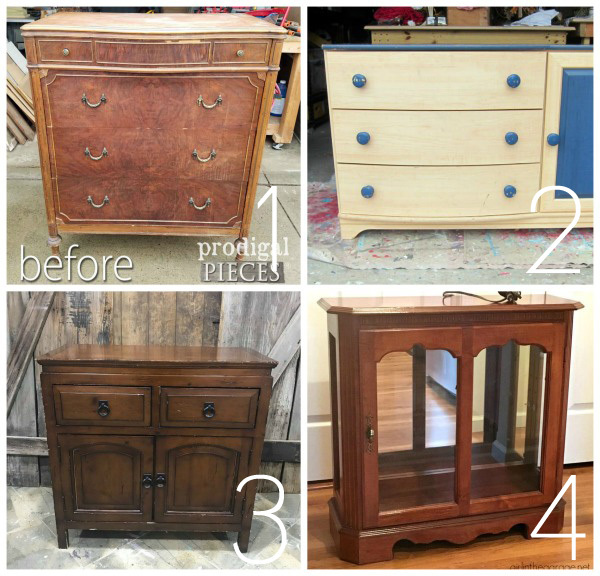 I share furniture makeovers all the time around here, but today my furniture flippin friends are joining in on the fun so be sure to look for links to their makeovers at the bottom! I passed on it once since it was priced out of my budget at $149, but when I stopped back in a week later, it had been marked down to $99. That’s the most I’m willing to pay, and these hutches are great sellers for me, so I was sold! White paint to the rescue! Oh and a little bead board as well! I’m considering adding hanging hardware to the tops and selling them separately…I may even see if I have a place to hang them around here. 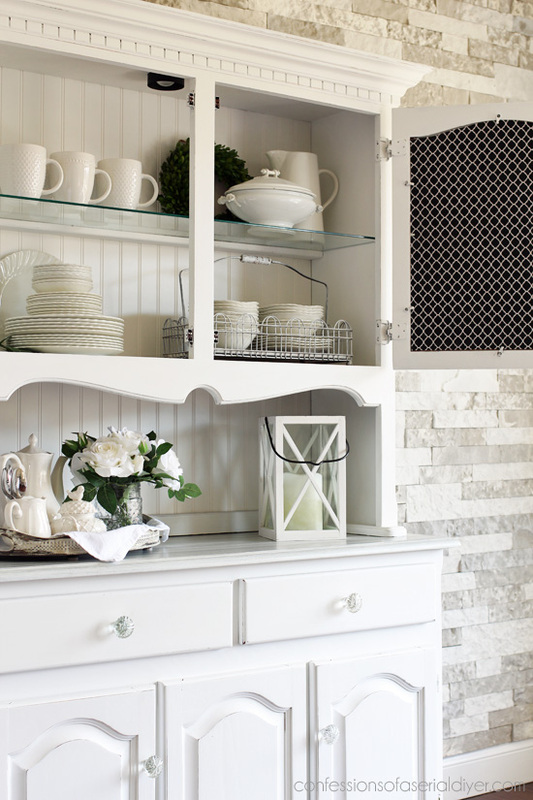 For the hutch though, the solid bead board adds closed storage and makes this hutch a fantastic storage piece now. Hopefully the bead board will also appeal to more buyers. 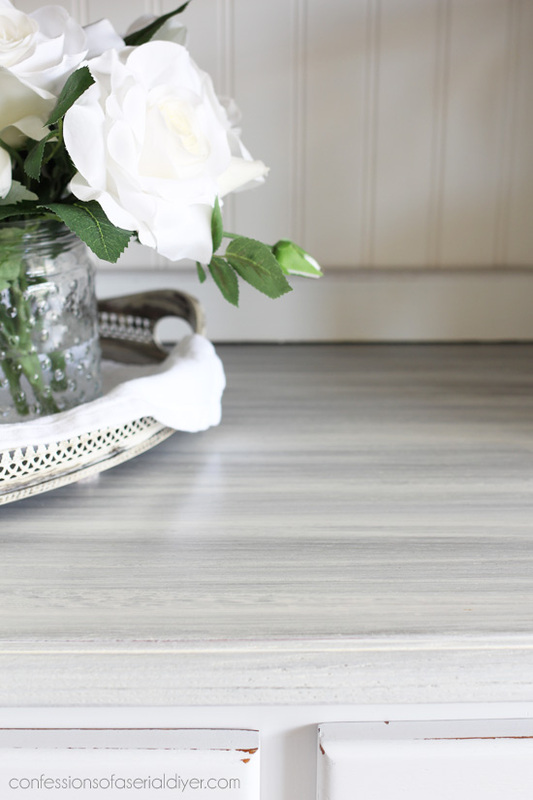 I used Behr’s Bit of Sugar made into DIY Chalk Paint. (Recipe with video HERE.) It took three coats for complete coverage. Then I sanded lightly and sealed with Annie Sloan’s Clear soft wax. For the top of the bottom unit, I had another plan in mind. I decided to whitewash it! I love this look! I used the very same technique as I used on my kitchen table, starting with sanding the top down and adding Varathane’s weather accelerator. It works pretty quickly, giving the wood surface a grey aged appearance. 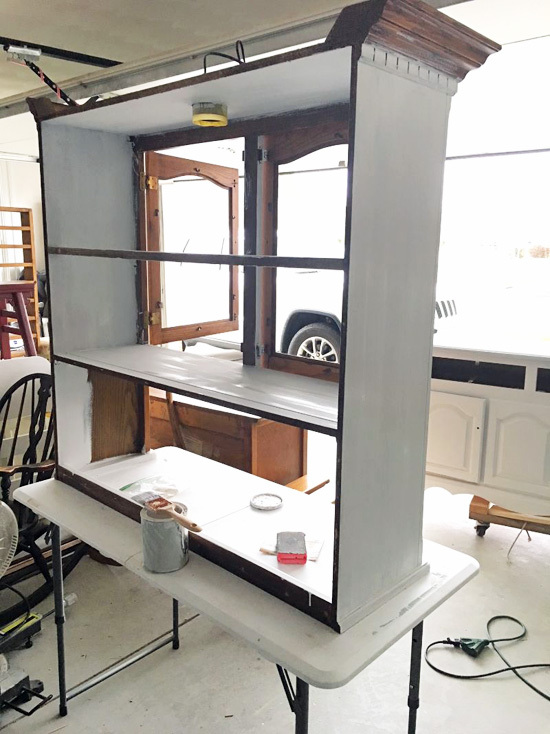 The rest involves watered down white paint and sealing the top with General Finishes High Performance Topcoat. See the process in detail (with photos of the process) in my kitchen table makeover post found HERE. To add the bead board panels to the door, I traced around the glass inserts, and cut the bead board out using my Ryobi Jigsaw. Since the backs were an ugly brown, I knew I either needed to paint them or…how about adding pretty fabric? I thought this would be fun for a pop of pattern when you open the door. I found this fabric at Hobby Lobby. I attached it using Matte Mod Podge. Then I trimmed the edges using a sharp exacto knife. It came just like you see here. I didn’t even need to paint it. Then I attached the fabric using Matte Mod Podge. You could even leave the doors open on the top to display some of your favorite things. 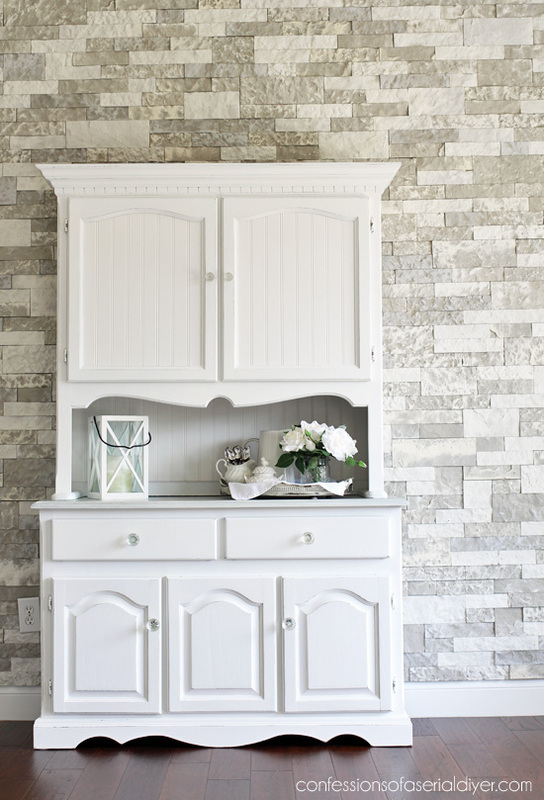 It looks so pretty here in my office against my pretty faux stone wall! I don’t usually come across these hutches for a great price very often, but guess what I picked up yesterday? I’m not quite sure if I’m ready to tackle another just yet, but this is an Ethan Allen for only $60! I had to bring it home! 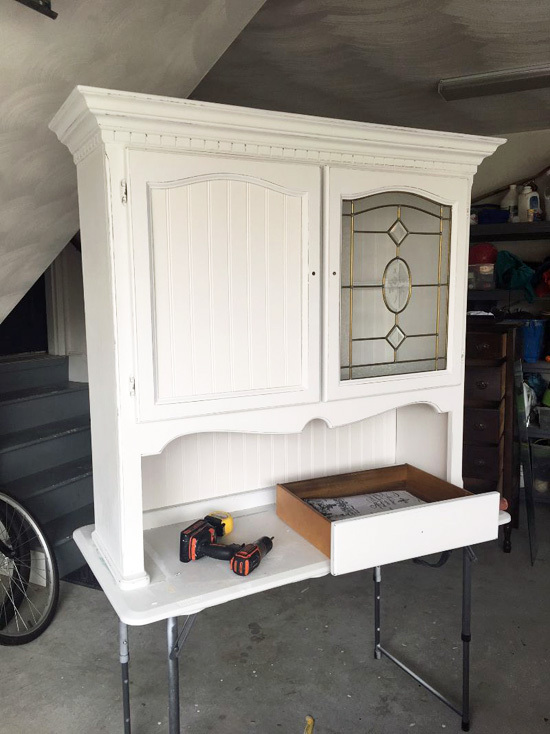 UPDATE: See how this hutch turned out HERE now! 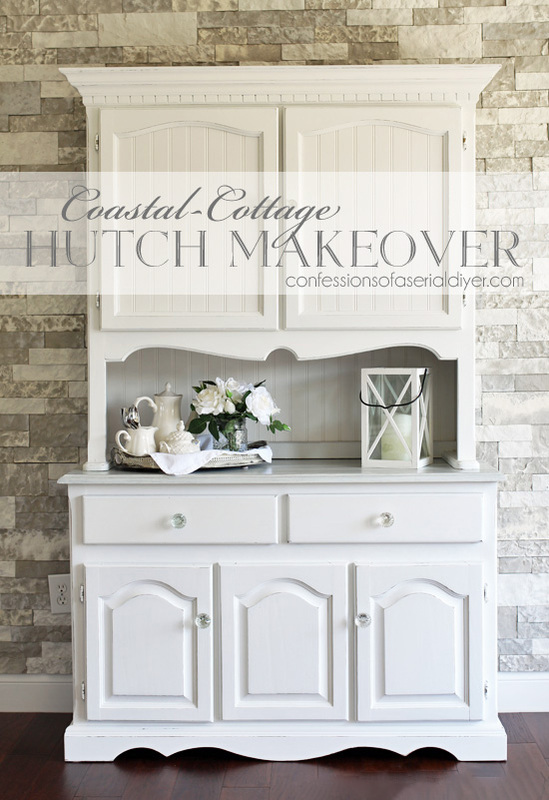 Don’t forget there are four more awesome makeovers for you to check out from my friends! 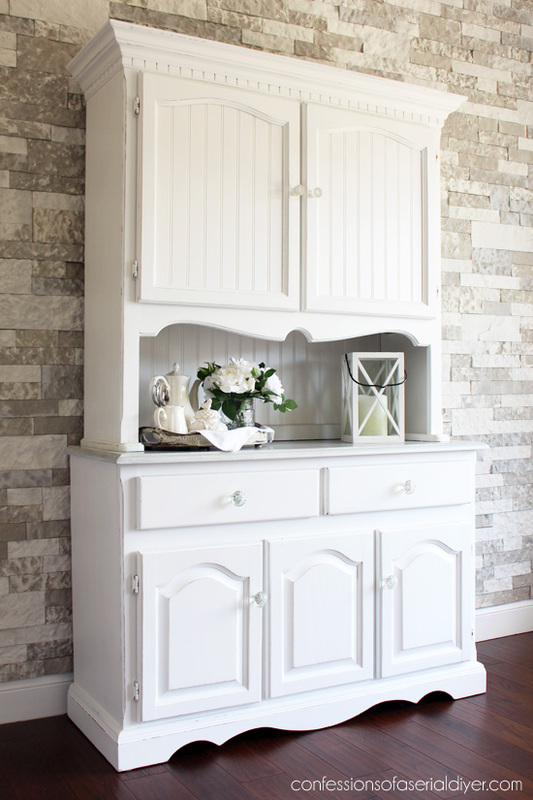 Here’s an oldie that you may not have seen yet…it is the only hutch that I did not paint white! See how it turned out HERE! I’ll be back on Tuesday sharing how I turned $7 worth of this greenery into a super simple wreath for Spring! Wow, totally amazing!! I LOVE how that turned out. You never cease to amaze me! I would so buy that piece if I lived in Virginia. 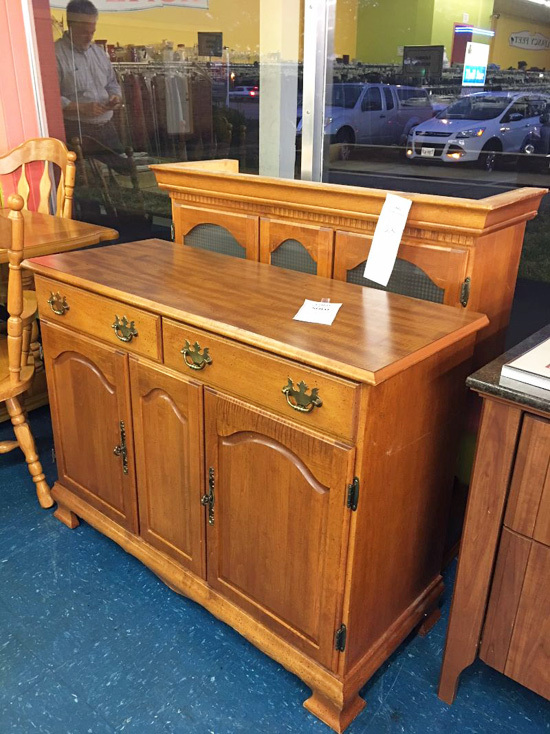 I was wondering if you had any ideas on how to get rid of musty smell in an old piece of furniture? I bought an old book case that has glass doors on it and it smells terrible. Your help will be appreciated. Love your transformations, so very inspirational!! Thanks for the info you found for me, you are AMAZING! I will let you know if they work. Christy, the top to the bottom of the hutch is beautiful. I mean, I absolutely love the look! I wanted to also ask if when you make your own chalk paint, is it always necessary to use flat paint? Is it because chalk paint is what I would call flat anyways? Your piece is just lovely and thank you for your time. Have a great day! Ohhhh Christy!!! What an amazing transformation! That back piece was indeed ugly! 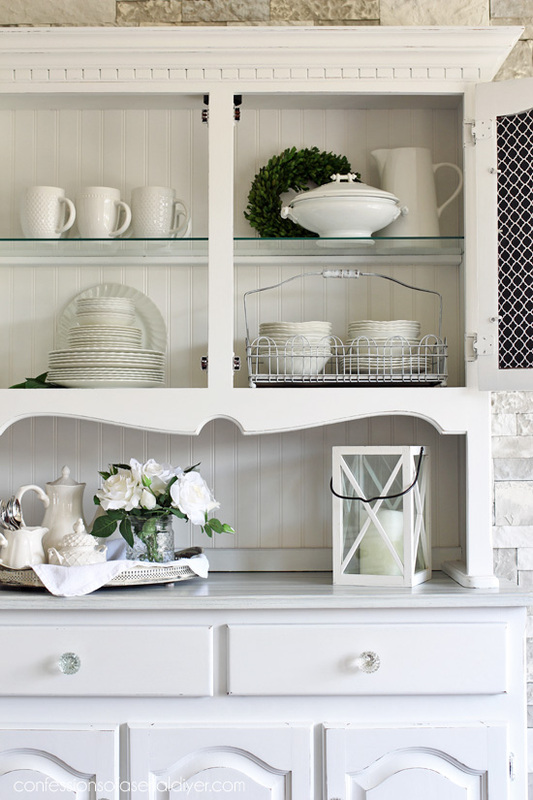 I love the beadboard, the white paint, the fabric on the back piece and drawers and the glass knobs! I love how you give new life to old pieces! Yet another beauty! 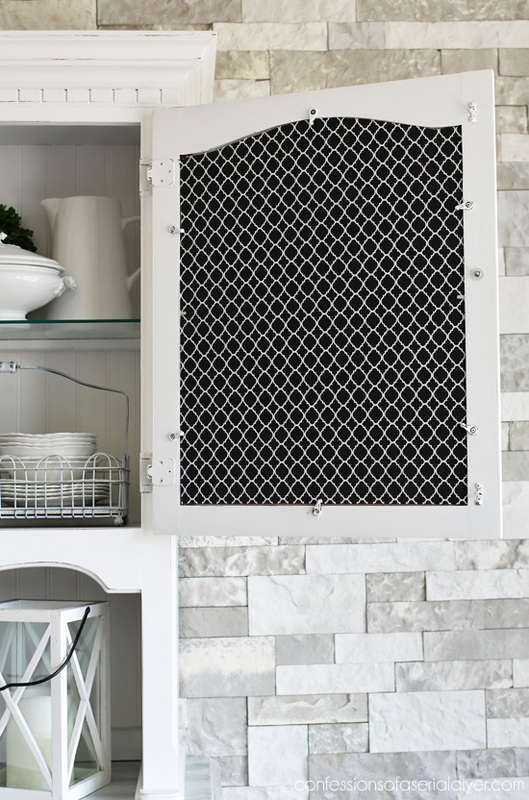 I agree about the glass inserts… pretty but… I adore bead board. 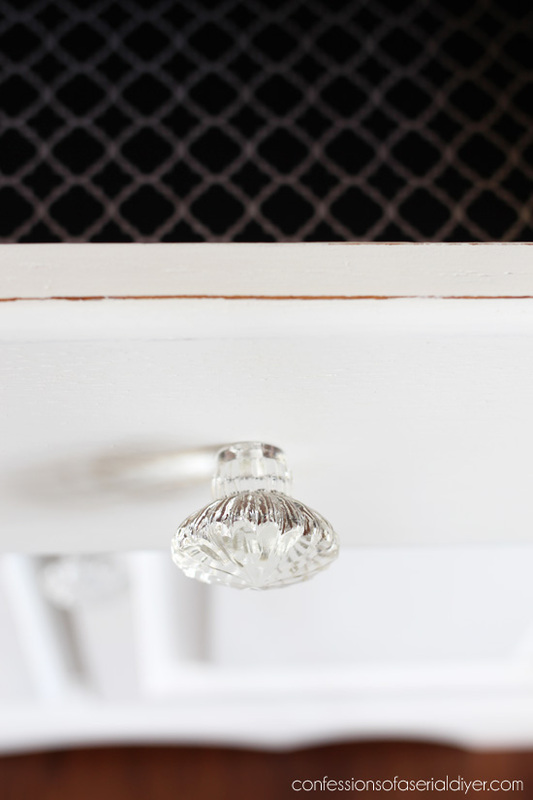 The glass knobs are just the right jewelry. That looks great. Love the bead board addition. If you don’t mind my asking, what will you price that for? Gorgeous! Great storage piece. Inspired. Wow, that is so beautiful!!! You are the queen of getting the details just right. I don’t think of things like fabric on door backs and drawer bottoms. Beautiful! I don’t think there is one thing I don’t like about this piece! 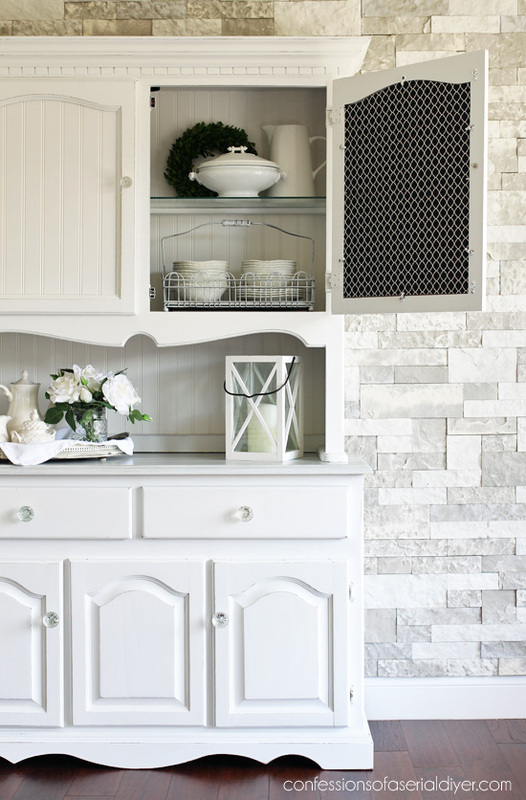 the beadboard is such an improvement to the backsplash and the doors. 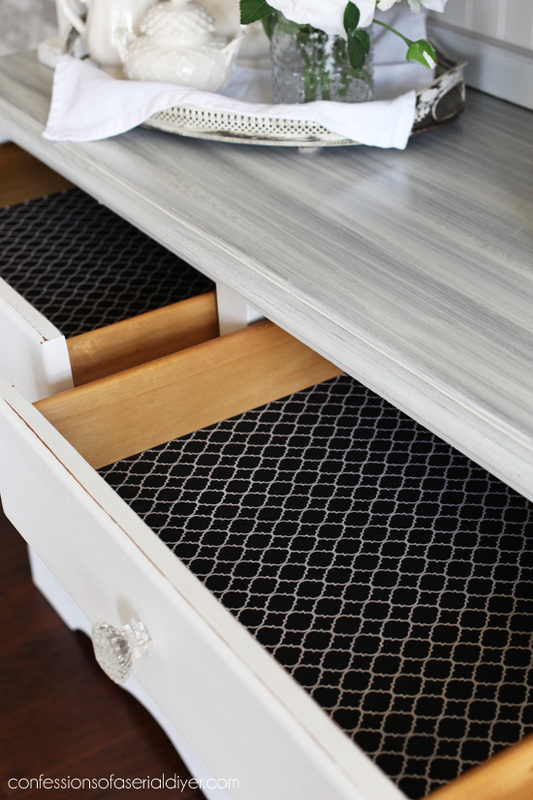 I love the fabric, it looks like chicken wire to me and the glass knobs looks great! and the brushed top looks great and adds just the right amount of dimension to the piece. now, what are you going to do with those dated leaded glass pieces? I love it! 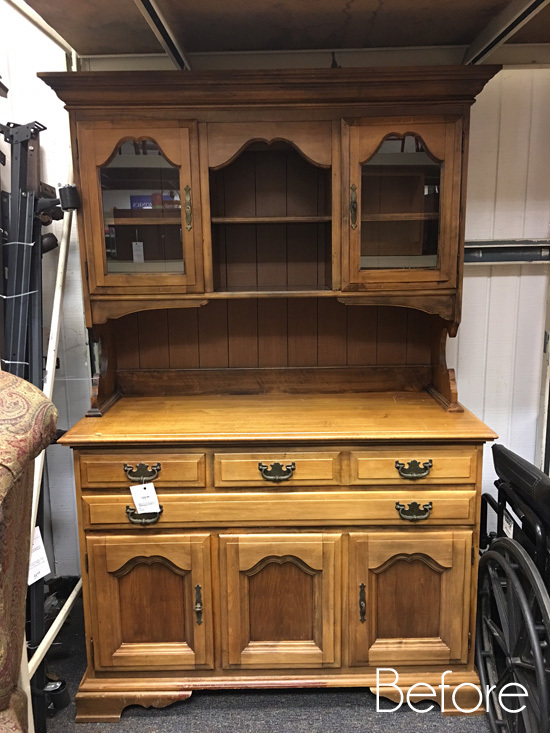 I have a similar oak hutch from the 80’s that I separated and painted the bottom portion white (top- dark stain)to use in my craft room. The top has been sitting in my basement. The glass doors feel dated to me but now I know what to do with them if I can find a place in my small home to hang it. Thank you! I love your weathered top finish. Simply beautiful! Your piece is hands down the best of the redos! You have such a great way of making the furniture look like it should have been that way from the beginning. 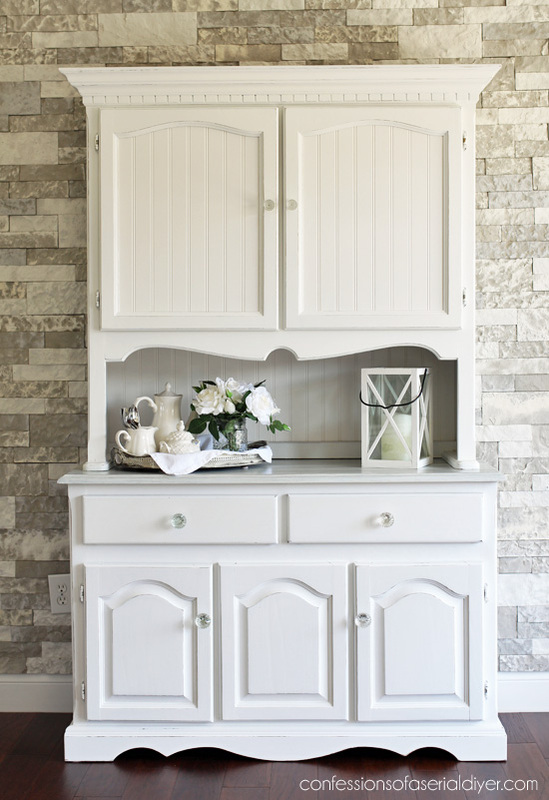 I did like the other white cabinet with the stained top. Thanks for the great upcycle. This came out so pretty! I love the beadboard over that dated glass! Perfect! So cute.I notice you almost always use a brush rather than your sprayer. Just wondered why? Look of the finish, clean up? It look wonderful, Christy! I love the headboard, whit paint, and pretty hardware. From drab to FAB! I love the farmhouse look! 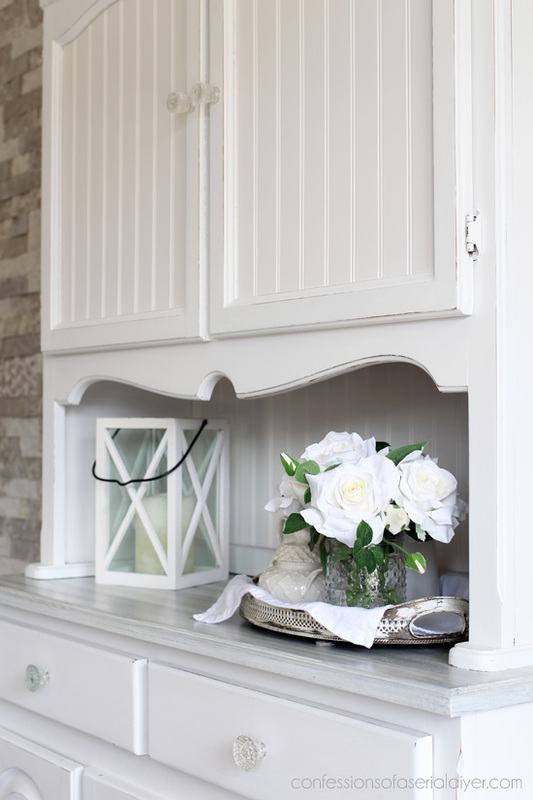 I updated my French Country hutch by replacing the glass door and sides with 1/4 plywood before I painted the entire piece Annie Sloan Chalk Paint in Pure White. I sealed it with a mix of clear and black wax (7 parts to 3 parts). The piece now looks like an antique armoire! I’m loving the closed storage. I covered the back of the door inserts with contact paper. 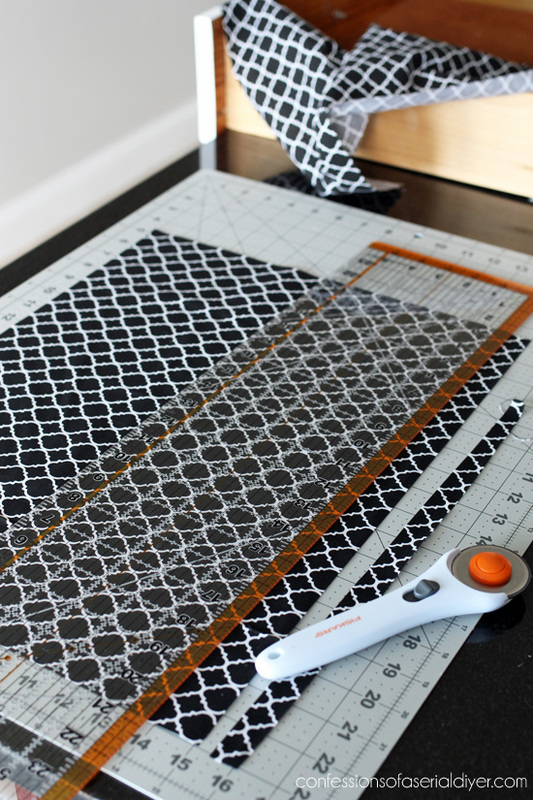 I love your Mod Podge/fabric treatment so now I’ll be on the look-out for the perfect fabric! Beautiful as always! 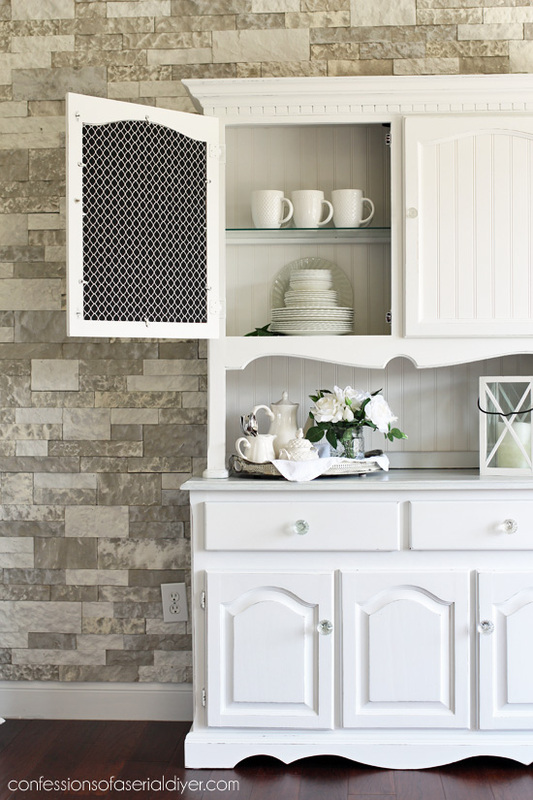 Love the bead board… You say that you didn’t paint it. Is this the paneling they have in the lumber area that is laying down flat? Looks like an ivory color to me when I’ve looked at it. Or is this a painted piece I haven’t seen at my HD? I want to get a piece to use as a background drop for photos. Wow Christy! That is absolute stunning! 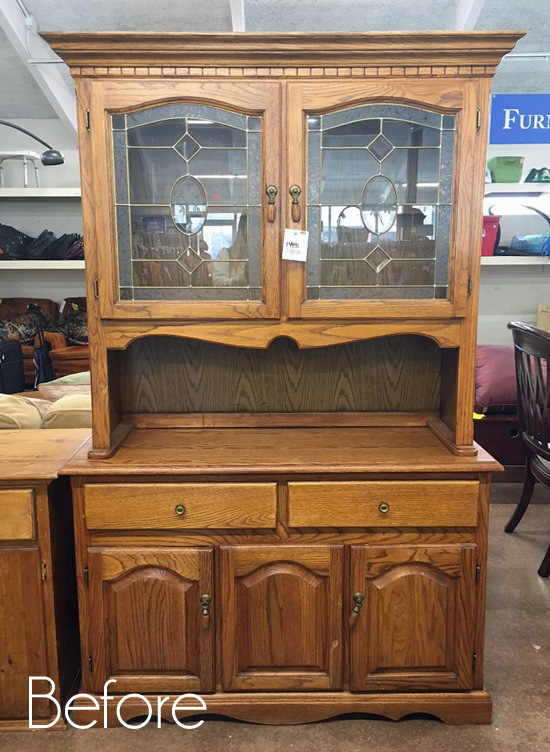 Your vision for this hutch was just gorgeous! It would be hard to let it go because it completely fits in your home. It’ll sell quickly for sure. Thank you for sharing and constantly inspiring me!! Another great makeover! 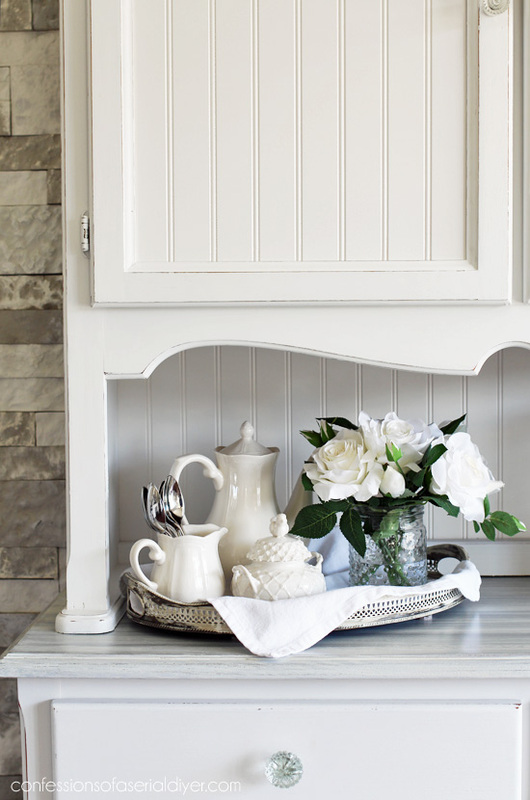 I love the beadboard…it says cottage to me with all the feel goods out there! WOW…..so much better. Beautiful job! 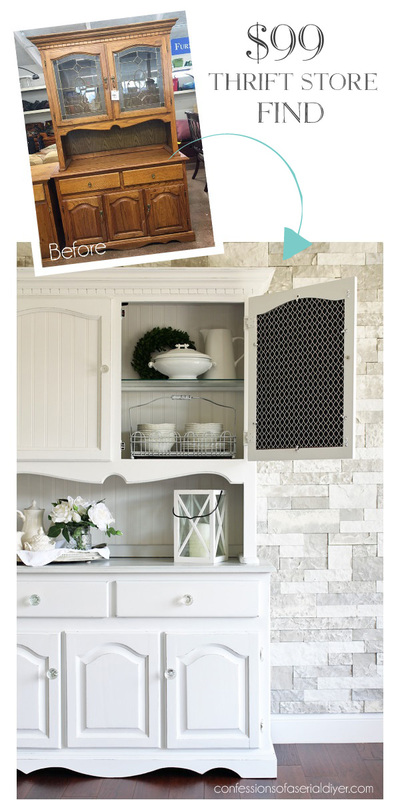 Wow, I like the transformation of that out-dated hutch. I mean, really, WOW! SO much more appealing. Good work! This is the reason I follow you every week my Lady. You take something that is bla and turn it in to WOW. Another winner for sure. Another masterpiece! 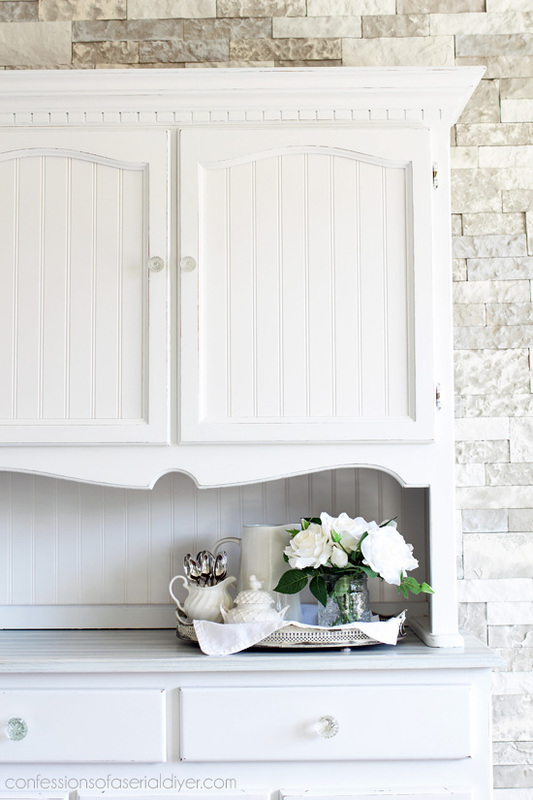 I’m a lover of bead board and anything you use it on gives it that country-cottage look. Love the way it turned out!! Christy, I love the top of the server section. It’s just what it needed with all that white. I heard about the vodka approach. I’ve never used it, but I heard it’s supposed to work well. How’s the weather by you? Up north, here, we’ve been getting some unseasonably warm weather lately. I think we’ve seen the last of the big snowstorms for Buffalo. See, we don’t always get a lot of snow! Thanks for including the cost you paid. I ran into one yesterday at my favorite thrift store. It was $150 and will be 50% off if still there Thursday. I many just have to go back to get it. I usually like the glass inserts especially when you take the time to paint the inside. But I agree with you choice with this one. I love the cottage look this big piece now has! It’s amazing how you know just how to change the pieces you find! Question, though: Are my eyes, possibly lighting, or merely my monitor, deceiving me?! The top and bottom pieces look to be (ever so slightly) two different shades of white. Is that right/intentional? Thanks for answering, because I’ve run out of one chalk paint color I’ve used on a piece, and would love to be able to just get “really close” with the second area to be painted. Since I’m OC, this is just yet another “critical” issue I encounter in my everyday life … !!! 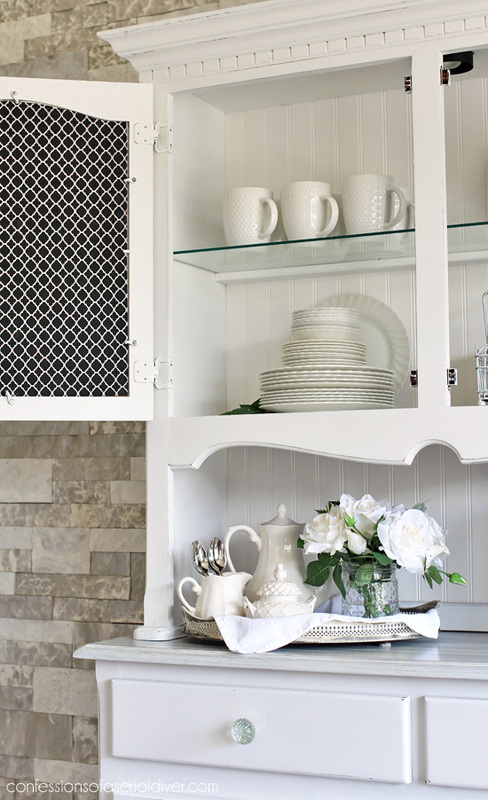 I had a hutch just like this one (until I turned it into a small pantry) and I’m loving the idea of replacing the glass with beadboard for closed storage. You just convinced me that I need to find another similar because it would be perfect for my office! Love the weathered top too.